A call to Camper & Nicholsons confirms a €2 million price drop on Simon Goldsworthy's listing, the 43m motor yacht Hana. Hana was built by Italy’s CRN yard in 2008. RINA classed and MCA compliant, she accommodates 11 guests in a full width master, three doubles and one twin stateroom with a Pullman berth. The second hull in the acclaimed CRN 43m series, this superyacht was designed with a light, modern interior for a family of experienced yacht owners and supervised carefully throughout her construction by an experienced project manager employed directly by the owner and with regular inspections by RINA (class) and MCA (commercial safety). Features include a full beam owners stateroom on the main deck with a private terrace and balcony, zero-speed at anchor stabilisers, integrated Apple TV with hard-drive, beach and gym area. 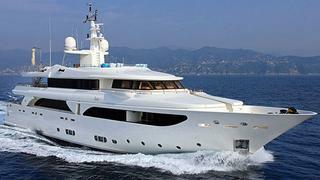 Available for inspection in Imperia until December 1st, Hana is now asking €12.95 million.